Just when one might think the entire Island has exhaled, think everything has downshifted, cut back, and spent all its energy, the galleries in the Arts District in Oak Bluffs are proving otherwise. “Late August and early September, things got busier,” says Alison Shaw, fine art photographer and, with partner Sue Dawson, co-owner of Alison Shaw Gallery. The Alison Shaw Gallery opened its 2010 season with Dawn, the first of its themed shows, so it was a matter of symmetry that the gallery end the season with Dusk, a collection featuring both powerful and dramatically colored photographs of day’s end, and subtle and quietly sophisticated scenes at dusk. Together with the other galleries in the Arts District that held openings this past Saturday, the response was one of the most enthusiastic of the season. She describes her technique of using the camera like a brush — “It’s painting with the camera” — explaining how, using a variety of shutter speeds, she moves the camera to achieve a softly textured effect that she achieved in her “Atlantic Ocean” series. 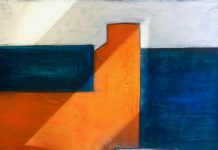 “We constantly have to reinvent ourselves,” she says, noting that the gallery features only her work, and that motivates her to stretch creatively. With their summer staff gone, she and Ms. Dawson have had to take on all the responsibilities. 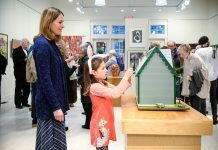 “Each of us was wearing three different hats instead of one,” Ms. Shaw says, describing the hectic preparations for the show’s opening. She is preparing for her fall workshops (“the Islander’s time of year”), both of which are already filled to capacity. Across Dukes County Avenue at Dragonfly Gallery, gallery owners and artists Susan Davy and her husband Don McKillop are talking with enamel jeweler Lucinda Sheldon. All agree, this is a wonderful time of year for the arts. 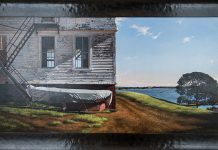 Among other artists, their gallery features Dan VanLandingham’s atmospheric landscapes, Laura Wilk’s brilliant water colors, Peter Batchelder’s stark and richly colored houses, and Robert Baart’s wonderfully rendered oil paintings. The gallery walls sparkle with the display of varied and serious artistic talent. His show of paintings by the gifted and broad-ranged painter Max Decker opened to a full house. To demonstrate the young artist’s diverse talents — both in music and art — Mr. Hunter had DJ Philippe Borde play Mr. Decker’s own originally composed and performed songs among the other selections. “Max didn’t paint all winter; he was working on his music,” Mr. Hunter says, explaining why the show was planned for September, “so he needed July and August to paint this diverse body of work.” He paints what Mr. Hunter refers to as “memory pieces — dreamy Van Gogh riffs,” as well as striking abstracts. 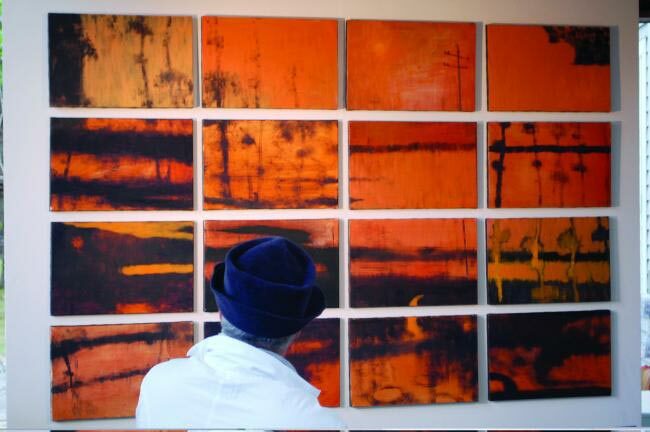 One of Mr. Decker’s most unique and original pieces is his 16-panel untitled piece, a bold orange and black painting that draws on his urban sensibilities. And all this goes on as the Island begins its transition to off-season life.